The seminar is intended for clarinet students at all levels of education, beginners, advanced players, and anyone wishing to perfect their knowledge of clarinet playing. The seminar will present working methods in music playing and stimulate participants to continue with their musical education. Special attention will be given to candidates preparing for further clarinet studies at secondary and university levels. As well as interpretation, participants will discuss the most common technical difficulties and the choice of different mouthpieces, reeds, etc. The seminar will involve a lot of practical work, so participants are advised to bring music for piano accompaniment. Andrej Zupan studied at the Academy of Music in Ljubljana, where he obtained his graduate and master’s degrees. Abroad, he studied under V. Mariozzi (St. Cecilia, Rome) and A. Brandhofer (Mozarteum, Salzburg). In 1995, he joined Orchestre des Jeunes de la Méditerranée in France, where he was first clarinet and with which he performed across Europe and Africa. As a soloist he has performed extensively with orchestras in Slovenia and abroad. He has won a total of eight first prizes in competitions for young musicians. In 1985, he was named ‘Yugoslav Musician of the Year’, and the same year, represented the country at the Eurovision concert in Madrid. In 1993, he became first clarinettist of the orchestra of the National Opera and Ballet in Ljubljana. 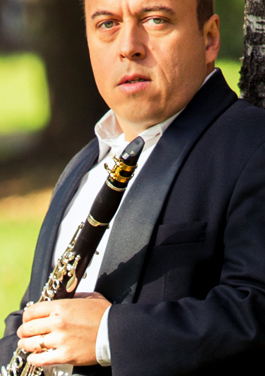 He is a co-founder and member of the internationally acclaimed Slovenian Clarinet Quartet, which has performed in a number of countries (Slovenia, Croatia, Italy, Austria, France, Belgium). He is a clarinet professor at the Ljubljana Conservatory of Music and Ballet, and an professor at the Ljubljana Academy of Music. He directs international clarinet seminars and master classes and is a member of international juries at clarinet competitions. As a soloist or member of chamber music ensembles, he has recorded a 21 of CDs for various record companies. He has gained an international reputation as a concert soloist and chamber musician proficient in various music genres, from classical to modern, klezmer, jazz, folk, world and even gypsy music. He has been Artistic Director of the Musical Summer at Podsreda Castle international music festival. Find out more at www.andrejzupan.com. 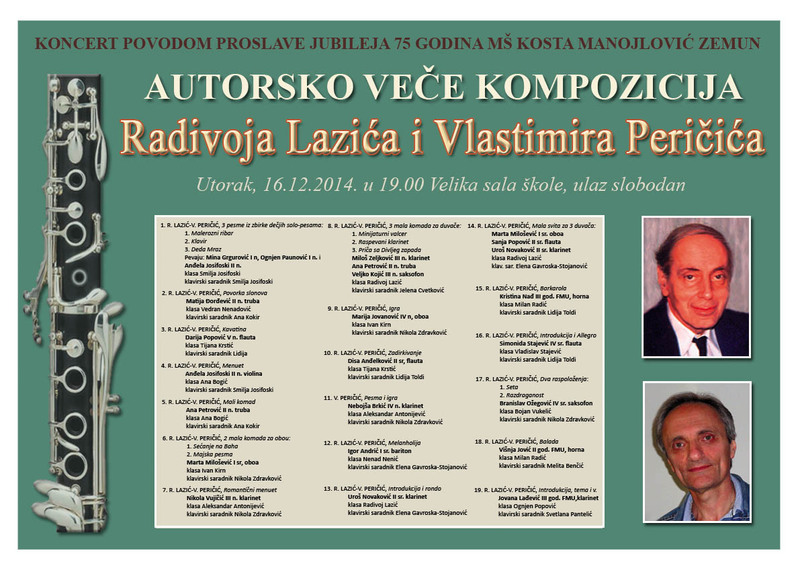 Wednesday, 10 December 2014, 8 p.m. , Ceremonial Hall of the Serbian Army, Brace Jugović 19. Admission is free. At the invitation of the Conservatory of Music & Ballet Ljubljana I arrived in Ljubljana on Monday, 10 November 2014. The clarinet elite from Ljubljana invited me to attend a concert of my compositions performed by students of clarinet of the Conservatory of Music & Ballet Ljubljana. An outstanding piano accompaniment for performers was entrusted to two piano associates Andrea Markun and Katalin Peter Krivokapič. The distinguished professors and clarinetists Joze Kotar, Dušan Sodja, Peter Kuder and Andrej Zupan had perfectly prepared the students of clarinet of the Conservatory of Music & Ballet Ljubljana. It was an unforgettable evening at the beautiful and full Concert Hall of the Conservatory. The young, excellent clarinetists of the Conservatory of Music & Ballet Ljubljana, the participants of the Master class of professor Radivoj Lazic, 10 November 2014. The young artists, all students of clarinet who performed there, showed remarkably mature playing and a high artistic level and their professors a marvelous quality of work devoted to them. On the day of the concert I received a great honor. In fact, I held a master class for all participants of the show. It was a nice gathering with young , outstanding clarinet enthusiasts, the participants of the evening concert. On this occasion, I would like to thank to all colleges of mine, the professors of clarinet in Ljubljana, accompanists and young performers, as well as on kindness and hospitality of the secretary and the head master of the KGBL, Dejan Prešiček. AN EVENING OF THE COMPOSERS RADIVOJ LAZIĆ & VLASTIMIR PERIČIĆ, EMONA Festival 2014, november 10, 2014, KGBL Ljubljana. Lara Hace – clarinet, class of professor Dušan Sodja, Katalin Peter Krivokapič – piano. AN EVENING OF THE COMPOSERS RADIVOJ LAZIĆ & VLASTIMIR PERIČIĆ, EMONA Festival 2014, november 10, 2014, KGBL Ljubljana. Andraž Jagodic – clarinet, class of professor Andrej Zupan, Andreja Markun – piano. AN EVENING OF THE COMPOSERS RADIVOJ LAZIĆ & VLASTIMIR PERIČIĆ, EMONA Festival 2014, november 10, 2014, KGBL Ljubljana. Gaja Benko – clarinet, class of professor Jože Kotar, Andreja Markun – piano. Vlastimir Peričić: SARABANDA E FUGHETTA for Clarinet and Piano (Homage to Bach). Video recording: AN EVENING OF THE COMPOSERS RADIVOJ LAZIĆ & VLASTIMIR PERIČIĆ, EMONA Festival 2014, november 10, 2014, KGBL Ljubljana. Maja Pungerčar – clarinet, class of professor Andrej Zupan, Andreja Markun – piano. Radivoj Lazić – Vlastimir Peričić: INTRODUZIONE E RONDO for Clarinet and Piano. Video recording: AN EVENING OF THE COMPOSERS RADIVOJ LAZIĆ & VLASTIMIR PERIČIĆ, EMONA Festival 2014, november 10, 2014, KGBL Ljubljana. 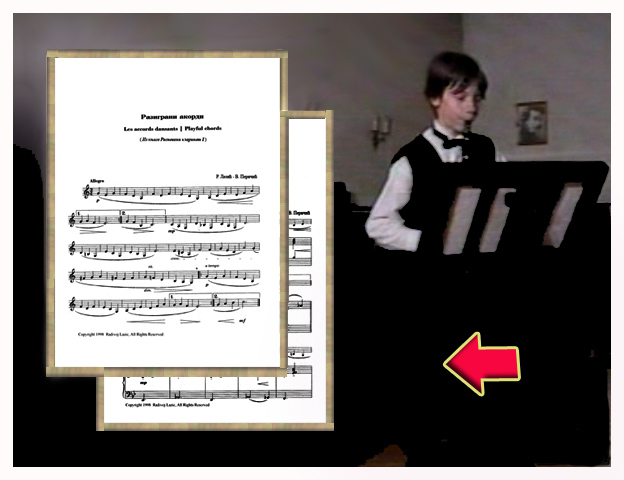 Luka Gantar – clarinet, class of professor Andrej Zupan, Andreja Markun – piano. Radivoj Lazić – Vlastimir Peričić: INTRODUZIONE, TEMA E VARIAZIONI for Clarinet and Piano. Video recording: AN EVENING OF THE COMPOSERS RADIVOJ LAZIĆ & VLASTIMIR PERIČIĆ, EMONA Festival 2014, november 10, 2014, KGBL Ljubljana. 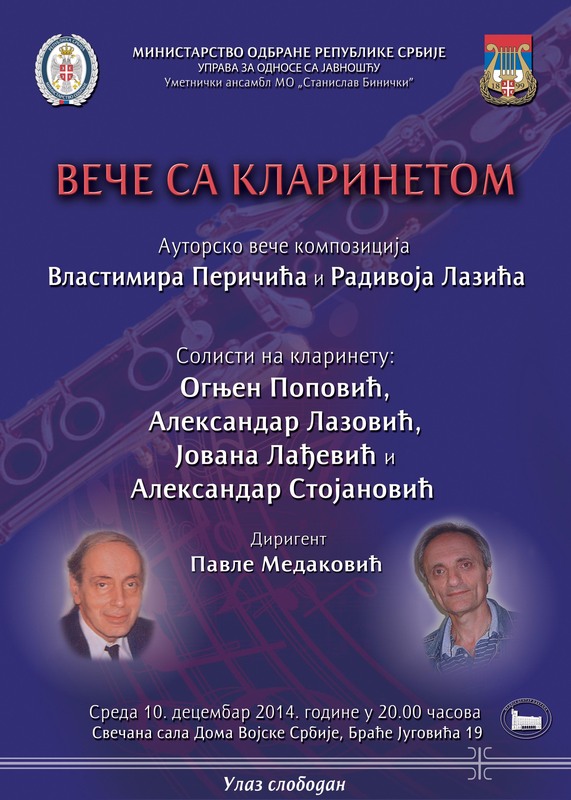 Denis Fortunat – clarinet, class of professor Andrej Zupan, Andreja Markun – piano. Radivoj Lazić – Vlastimir Peričić: ROMANTIC CONCERTO IN A MINOR, I Mov. for Clarinet and Piano. Video recording: AN EVENING OF THE COMPOSERS RADIVOJ LAZIĆ & VLASTIMIR PERIČIĆ, EMONA Festival 2014, november 10, 2014, KGBL Ljubljana. Katijana Rener – clarinet, class of professor Andrej Zupan, Andreja Markun – piano. Radivoj Lazić – Vlastimir Peričić: ROMANTIC CONCERTO IN A MINOR, II Mov. for Clarinet and Piano. Video recording: AN EVENING OF THE COMPOSERS RADIVOJ LAZIĆ & VLASTIMIR PERIČIĆ, EMONA Festival 2014, november 10, 2014, KGBL Ljubljana. Blaž Stopar – clarinet, class of professor Peter Kuder, Andreja Markun – piano. Radivoj Lazić – Vlastimir Peričić: ROMANTIC CONCERTO IN A MINOR, III Mov. for Clarinet and Piano. Video recording: AN EVENING OF THE COMPOSERS RADIVOJ LAZIĆ & VLASTIMIR PERIČIĆ, EMONA Festival 2014, november 10, 2014, KGBL Ljubljana. Urška Zupan – clarinet, class of professor Dušan Sodja, Katalin Peter Krivokapič – piano. Radivoj Lazić – Vlastimir Peričić: ROMANTIC CONCERTO IN A MINOR, I Mov. for Clarinet and Piano. Video recording: AN EVENING OF THE COMPOSERS RADIVOJ LAZIĆ & VLASTIMIR PERIČIĆ, EMONA Festival 2014, november 10, 2014, KGBL Ljubljana. Tamara Popovič – clarinet, class of professor Andrej Zupan, Andreja Markun – piano. 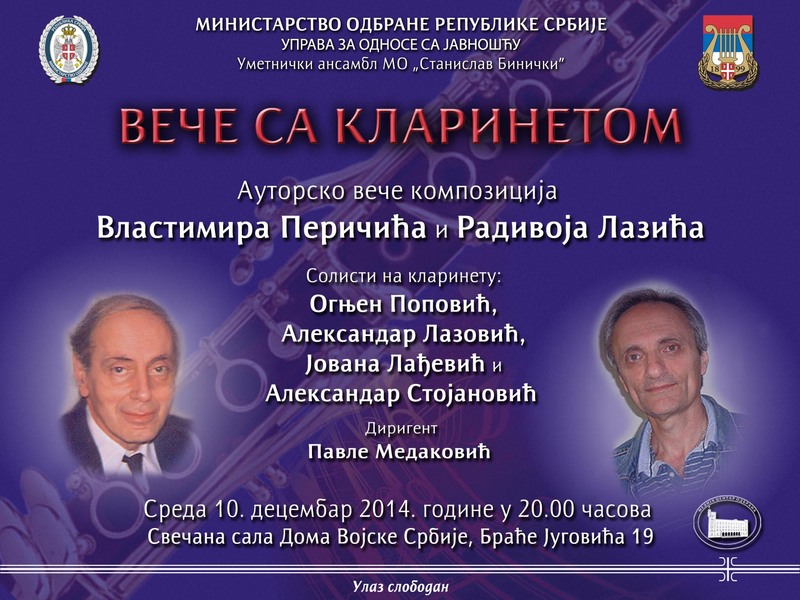 Meet and listen to the author's rich literature for the clarinet. Download your favorite PDF notes. See, read, listen and ,of course, ENJOY!